I had no intention of making every post about Microsoft, but it seems like that is the life I now lead. I guess moving forward, most of what I’ll be blogging about will be Microsoft-focused. You have been warned. I am asked daily for recommendations for companies to assist other companies, and I always point them to same site: Microsoft PinPoint. PinPoint matches clients with Microsoft Partners, particularly the ones who have the expertise you are most in need of. Clients can search for partners with a required skillset, industry, and/or competencies, and partners can register on PinPoint with the services they offer. I have always recommend working with a Microsoft partner, for a variety of reasons, and using PinPoint ensures that are you receiving assistance from a company who meets Microsoft standards. In the example above, I have searched for partners based on the business need “Cloud Computing in Guelph, Ontario” and I have 3 matches. 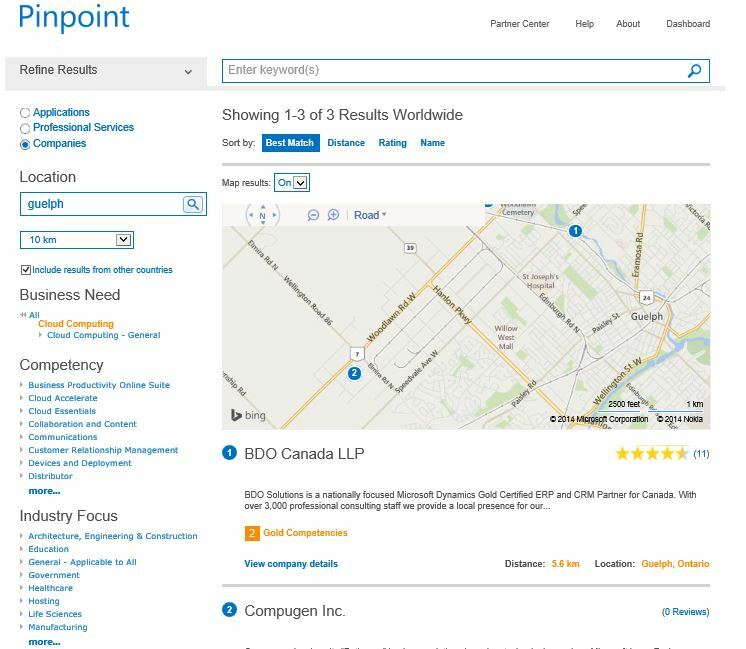 If we examine the first result, BDO Canada LLP, we know the company has 2 gold Competencies, and has 11 positive reviews. We can then view the company details and decide if this company will meet our needs. We can also examine other results and compare them to see which one best fits our demands. Pinpoint can help you find a qualified Microsoft Partner with just a few clicks of the mouse. If you are a Microsoft Partner looking to expand your client base, you should register for PinPoint (it’s also completely free!) If you are already on PinPoint, please ensure your profile is up-to-date. Keeping your profile current can help companies in need of your service find you. As a Microsoft partner, for more information about PinPoint services, reach out to your partner manager. If you are unsure of who that is, please contact me for assistance. P.S. I always recommend working with a qualified Microsoft Partner, and I’m not just saying this because of my association with Microsoft. Would you take your car to a non-certified mechanic? Why trust your data to an unqualified “professional”?